You don’t need to wait until your child is in school to help them learn math. There are some easy ways younger children can practice their math skills at home. Here are some of them. There are plenty of activities you can try at home to teach your child early math skills. Not everything surrounding math involves adding and subtracting. Math skills also include matching, classifying, comparing, and measuring. These abilities will help your child learn to identify and describe the relationship between objects. Jump start your child’s learning with these activities and teach them to appreciate math. Compare: Comparing involves finding the similarities and differences between someone or something. Your child can compare how one of their toys is similar to the other, or how mom and dad are not the same. The ability to compare will help them learn to classify. Classify: Classifying is grouping things that are alike. Have your child classify their toys. Maybe they can do it by color, toys that have wheels, or toys that are soft or hard. Once they’ve divided their toys into groups, they can look for more specific details. Match: Matching involves making pairs. The best way to practice matching is by playing the game Memory. Not only will they be working on their math skills, but they will also be strengthening their memory. All you need to do is place different pairs of cards face down and have your child flip two of them. If they match, they get to flip another pair. If they don’t, they have to put them back face down. Measure: To measure is to determine the size of something. 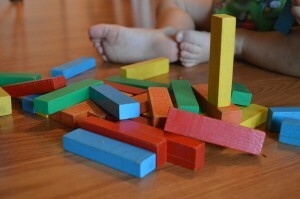 They can use a ruler to measure toy blocks or use a wall to measure themselves. Developing early math skills will make your child’s journey in school easier. If you have older children who need to work on their math abilities, sign them up for tutoring. Contact The Tutoring Center, Fulshear TX at (281) 346-8120 to learn about their tutoring programs.